School is starting in two and a half weeks here in The South. August 5, to be exact. I can't quite believe it, I feel like it should still be a month away, or at the very least it should be the END of August! Anyway, school is coming and Roo has been on a sewing bender recently so we decided to make lunch bags. Of course, I didn't have a pattern so I had to make one up. 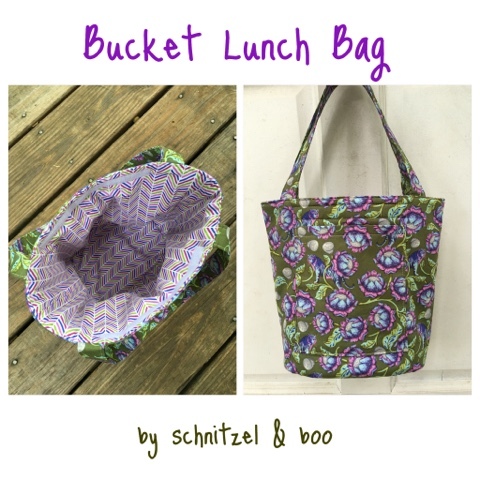 This one is really simple and has just enough room for one of those nifty lunch cubes and a water bottle. **Following manufacturer's instructions, fuse interfacing to the wrong side of coordinating exterior pieces. For the handles, fold the length of each handle in half, wrong sides together; press. Unfold, then turn each long edge into this center fold line; press. Fold again on the center line, making sure edges are nicely tucked in to the center; press. Edge stitch long edges of both handles, starting with the edge with two folds. 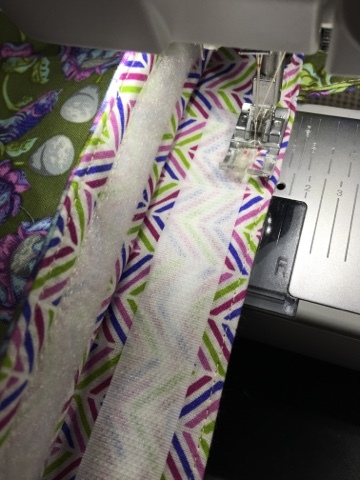 This will prevent twisting and bunching during stitching. 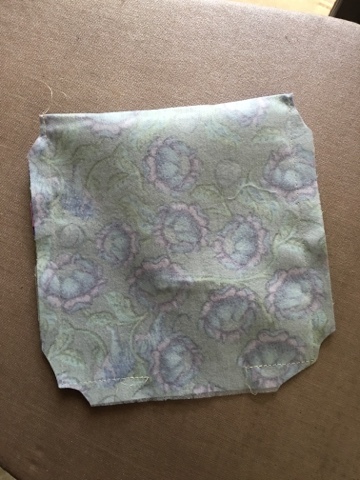 For the pocket: fold in half, wrong sides together, to create a 7" square. 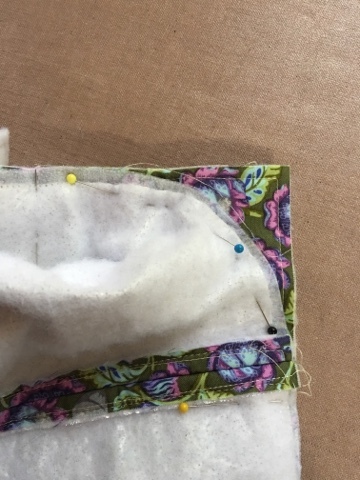 Pin along the bottom and sides, leaving a 3"-4" space for turning; stitch, making sure to back stitch on each side of the opening and at the top edge. DO NOT sew the top (folded) edge. Clip corners; turn and press. Topstitch 1/2" from folded edge. Fold the pocket in half from side to side; finger press. Fold the front piece in half, side to side; finger press and/or mark center lines with a pin. Place a ruler 2" down from too edge of bag front. Align the finished edge of pocket along the ruler, matching centers of pocket and front. Pin in place; edge stitch 1/8" from edge of pocket. Match up the edges of Insulbright to the wrong side of front/back; baste inside the seam line to keep everything in place. Repeat for the bottom, but sandwich the canvas with the Insulbright as well. Place right side of bag back fo the front; stitch. Finger press seams open; from the right side of the bag, stitch the seam down using 1/4" seam allowance on both sides of the seam. 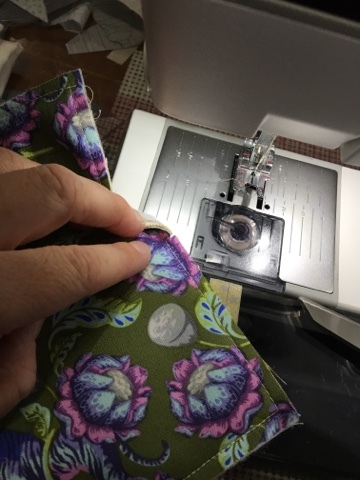 Find the center of the front and back by matching up side seams and making a small 1/4" snip inside the seam line. Fold the bag bottom in half both ways, snip each time. Repeat for all three remaining corner; stitch. Trim seam allowance with pinking shears, or snip notches into the corners with regular scissors. Place edge of handle on either side of pocket; baste. Match front/back together for easiest handle placement guide; pin handle and baste in place. Turn exterior right side out. Leave interior wrong side out. Insert bag into lining, right sides together, matching side seams. Pin around the edge, leaving a 4"-5" gap for turning; stitch making sure to backstitch on both sides of opening. Carefully pull the bag out through the opening of the lining; press. Edgestitch all the way around the bag, keeping handles out of the stitching line. Place the wrong side of Velcro on the lining, about 1/2" down from the top, centered between the straps. 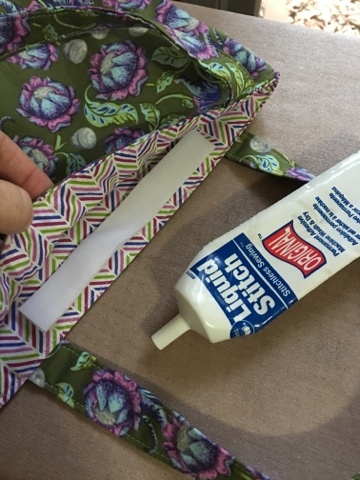 Use Liquid Stitch glue to hold Velcro in place. Wait about 15-20 minutes before stitching in place. That's it! 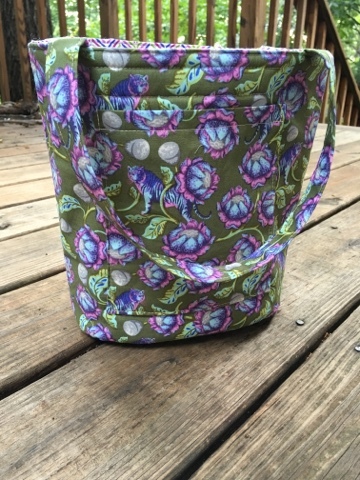 Feel free to use a coordinating fabric for the pocket and handles, or go crazy and make it patchwork! Tag me in Instagram if you decide to make one. It's my turn for Sew-A-Softie Day! Thanks to Trixi of Coloured Buttons for organizing a world-wide "day" of sewing and teaching someone new to our world! I'm excited about my tutorial, I think you're going to love it. It's a lot easier than you might think. 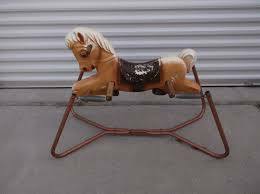 Did you have a hobby horse, otherwise known as a 'stick horse', when you were a kid? I remember having the kind on springs mounted to a metal frame. If you really got rocking on it, you could almost touch the ground with your nose. I'm not sure how it never tipped over! I suppose you can buy them new, nowadays, and I bet they've been redesigned with more safety features, and I bet a kid can no longer shorten their nose on the pavement on one. Oh well, you can make the next best thing right now! Just gather up your supplies and in a few hours, your kid will be traipsing through the wild, wild west fighting off the bad guys from horseback! Or, you'll have the prize winning baby shower or first birthday gift. Plus the usual stuff: sewing machine, thread, scissors, optional pinking shears etc. 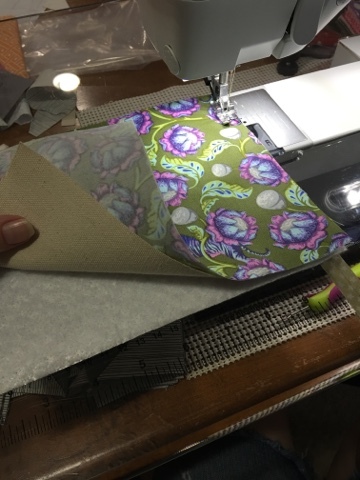 To create the pattern, you will need to cut the bottom off the paper sack, then cut it down the back seam to open it up flat. You will only need about half of the sack, so set the other piece aside for future use. -Starting at the bottom right side of the paper, draw a 5" line. -On the right side of the line, draw a 14" perpendicular line up towards the top of the paper. -Now, connect the 3" line to the 14" line in one long 13" diagonal line. For the neck, the curve should connect underneath not inside. If you look closely at my photo, I did it wrong at first but then scratched it out and resketched it on the underside. This is the ear placement; see photo below for details. -Measure 4 1/2" from the upper right corner, make a mark. -Measure 1 1/2" up from bottom right corner, make a mark. These two marks are for hair placement. Cut two heads from fabric, and two from interfacing. 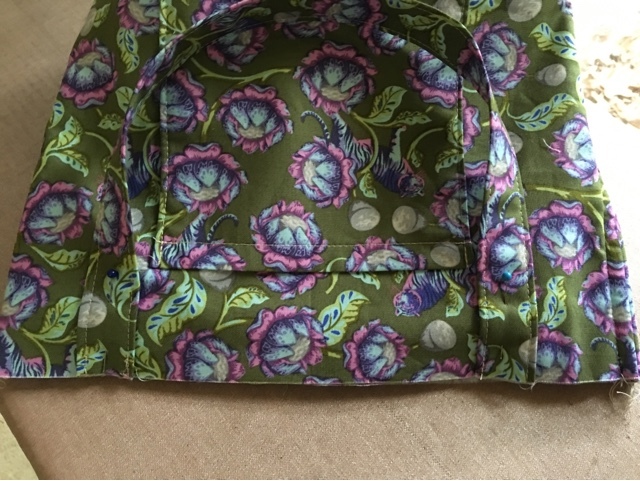 Follow manufacturer's instructions to fuse interfacing to wrong side of fabric head. Use a fabric marker to transfer hair placement lines on one side of the horse. -For the ear, fold a 7" square scrap of paper in half. -From the fold, draw a 1 1/2" perpendicular line. -Draw a parallel line 1/2" below to mark seam allowance. -From this line, measure up 5" on the fold and make a mark. -Connect the two lines using the photo below as a guide. Cut two ears from fabric, two from interfacing and two from white felt scrap. Follow manufacturer's instructions to fuse interfacing to wrong side of fabric ears. -For the eye, draw a 3 1/2" line on another 7" square scrap of paper. -Using the spool of ribbon, align the curve just far enough to connect the points. -Fold along the line, then cut out the eye pattern. Cut two eyes from white felt and two from EZ Steam II. Follow manufacturer's instructions to apply EZ Steam to back of eye. -For the iris, use the small bowl, spice jar or hand draw onto a piece of paper. I used a tin teacup from my daughter's play tea set. Cut two eyes from colored felt and two from EZ Steam II. Follow manufacturer's instructions to apply EZ Steam to back of iris. For the pupil, I used the iris piece to trace onto black felt and then cut it down to fit. Cut two pupils from black felt and two from EZ Steam II. Follow manufacturer's instructions to apply EZ Steam to back of pupil. Now you're ready to get sewing. That's the best part! Yay! With wrong sides together, sew one fabric ear to one felt ear; using pinking shears (optional) carefully trim the seam allowance in half. If you don't have pinking shears just use scissors. Turn ears right side out; press. Topstitch using a 1/8" seam allowance. Measure up 1/2" from bottom of ear; draw a line. Fold the ear in half, felt sides in. Measure over 3/8" from the fold; draw a 1/2" line (parallel to the fold). Stitch along this line, making sure to backstitch at both ends. Place horse heads wrong sides together with the pattern laid on top. Using a rotary cutter and acrylic ruler, carefully cut along the ear placement line. 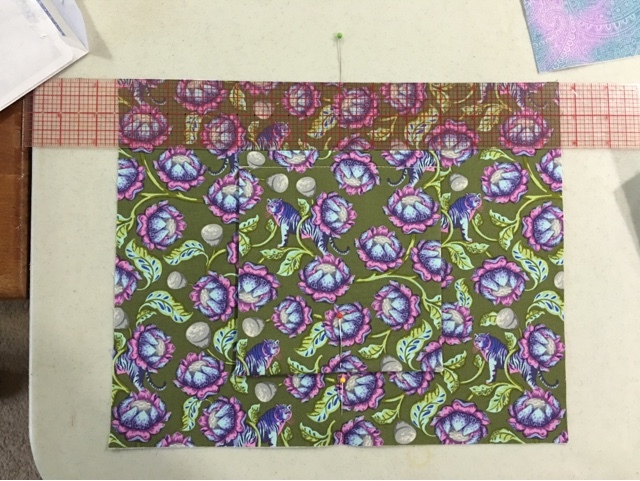 If you don't have a rotary cutter and ruler, align the fabric and pattern pieces, fold along the ear placement line and draw the line directly on the fabric; cut through both layers with scissors. 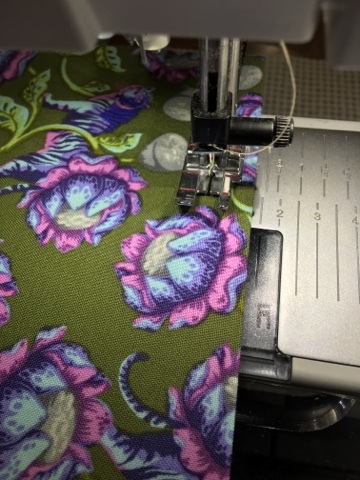 Lay one head right side up, with felt side of ear down, insert ear into slit aligning the line you drew to the cut in the fabric; edge stitch in place, making sure to backstitch at both ends. To make eyelashes, cut V notches into a 1"x 2" rectangle of double layer of felt. Peel off paper backing from the eye, place on the head somewhere you think looks best. Starting from the outer corner of the eye, place one eyelash under the eye, curving it along with the shape of the eye. Using a press cloth to prevent melting the felt, press into place; edge stitch. Place heads wrong sides together, turn it over so the half with the eye stitched down is on the bottom. Peel the paper off the back of the second eye and stick down in place in the same spot as the first one. You may want to trace the outline first, just to make sure you stick it down in the right place; edge stitch in place. Place and edge stitch the iris next, followed by the pupil. Starting at the bottom, pin lace/fringe/hair to right side of horse between placement lines. You may want one layer or more, depending on the thickness and look of the trim you chose. Baste trim in place, using a wide stitch setting. Place heads right sides together; pin. 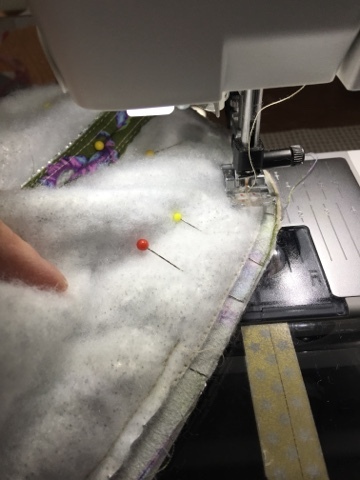 Using a very small stitch setting (on my machine a normal stitch length is 2.5, for doll/softie sewing, I use a 1.5) stitch all the way around the horse, leaving the neck open. 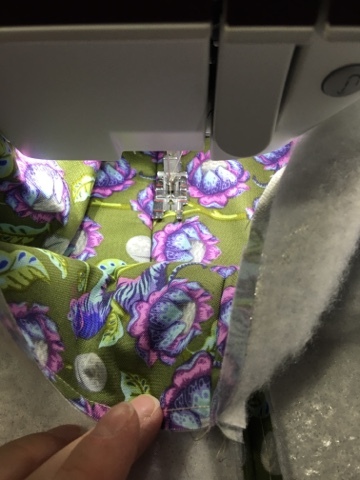 Carefully trim the seam allowance in half along the curves. Now it's time to start stuffing! But first, plug in the hot glue gun. Use small pieces, about the size of a mandarin orange, to fill the nose, cheeks and forehead area. Get a slightly bigger ball of fluff together, squeeze out a blob of glue onto the end of the dowel and stick the fluff down. If you want, cover the fluff with a large scrap of fabric, gluing the edges to the stick, over the fluff. Optional: cover the raw edges of the fabric scrap with ribbon. 1 1/2" of room left. Use a rubber band or string to gather the fabric around the pole. Cover this mess with the coordinating ribbon by alternating squeezing some hot glue around the fabric and winding the ribbon down around the stick. Wrap the reign/harness ribbon around the nose of the horse; use hot glue to stick it to the underside of the horse. Cut a 20" length of the ribbon for the reigns; tuck one end on each side of the horse's face under the harness. Use hot glue to keep it in place. Decorate as desired. You're all finished! Now that you've got your pattern, you can make it bigger or smaller according to your tastes and the next horse will be easier and faster to make. Well done, You! If you enjoyed this tutorial, I hope you'll take a look through the rest of the contributors. There are some really great ideas for sewists of all levels from some of our industry's most talented makers and designers. Thank you to Trixi for organizing this event and for helping to encourage our next generation of sewing people! Please join the softie sewing community on Facebook for more inspiration.